Source: Princeton Infrared Technologies, Inc. The new LineCAM12 from Princeton Infrared Technologies is an InGaAs linescan camera designed to operate in the shortwave infrared (SWIR) and visible spectrum, from 0.4 to 1.7 µm. This camera utilizes a 1024 x 1 state of the art InGaAs linear array imager on 12.5μm pitch. It is currently available in a 250 mm tall pixel model for spectroscopy, and 12.5 mm square pixel model for machine vision applications. 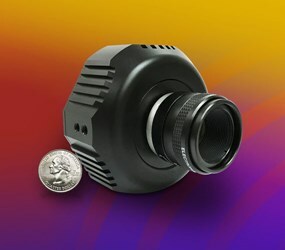 The LineCAM12 camera features 14 bit digital data at 37 klines/s on USB3 or Camera Link outputs. With incredible versatility, the camera enables full wells from 75 ke- to 100 Me- with 128 steps of variation, and integration times from 10 ms to 10 s. The lattice matched InGaAs array is backside illuminated, and can be customized to allow optical filters to be placed on the active detector area, which is nearly impossible in front side illuminated devices. For more features, specifications, and diagrams on the LineCAM12, download the datasheet.